We were asked to clean some carpets for a local company based in Rutland. Whilst there we came across an office chair that had clearly had a hard time . It was neglected and was going to be thrown out. Whilst waiting for our carpet solutions to do their magic we quickly turned out attention to this unloved chair. With an application of Solutions M-Power and some gentle agitation to ensure all the fibres were covered, the stains started to disappear. M-Power works differently to other cleaning products. It can best be described as being like a small animal taking small bites of food at a time, but in this case the ‘food’ is the dirt attached to the fibres, and it keeps eating until all the food has gone. 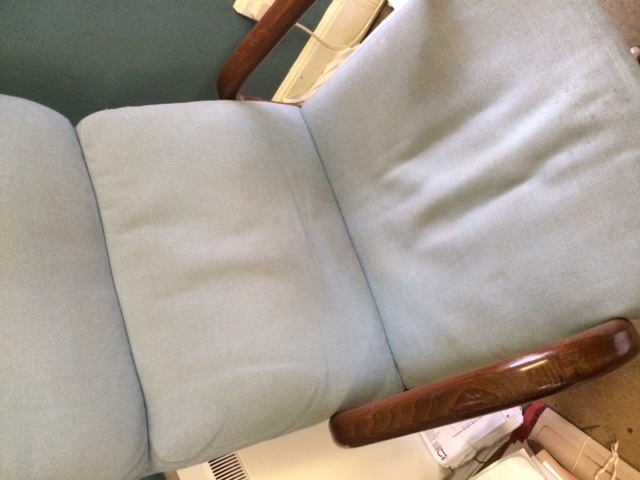 Having finished the carpets we returned to the chair to find that it was now clean and ready to use again. We have pointed out on our website and to customers before that the products we use are eco-friendly , but this now adds a new twist to that as a chair destined for landfill is now back in use.